"We're viewing this as a combination that will make Alaska stronger and better positioned to remain a successful, independent, Seattle-based company for decades to come." There's no way of knowing the extent to which the shadow of Delta Airlines hung over Alaska Air Group's decision last fall to connect with Virgin America about a possible takeover. But regardless, a local business community troubled for months that it needed to figure out how to help Alaska Airlines ward off what was perceived as a takeover effort by Delta Airlines can stop worrying. Alaska saved itself. That's the underlying fact about the announcement last week that Alaska has agreed to buy Virgin America for $2.6 billion cash, with assumed debt, leases and other costs bringing the total to about $4 billion. That's a figure viewed by some experts as too much -- a huge premium that Alaska had to pay on Virgin's market valuation to beat out JetBlue to land the deal. But it depends on what a company like Alaska is buying. And in Alaska's case, it's a twofer, or maybe a threefer, as it dramatically expands its California presence and keeps Jet Blue from acquiring Virgin's lucrative California routes. But maybe most importantly, it pretty much ends the concern about a Delta takeover strategy. Concern over any Delta designs on Alaska should pass, if for no other reason than that the Justice Department wouldn't be likely to allow one of the Big Four carriers to buy number five, which is where the Virgin deal, once approved, would place Alaska. That Justice Department point was offered by Joseph Shocken, president of Seattle's Broadmark Capital, when I asked him his thoughts after the Virgin announcement, since Shocken was perhaps the most outspoken business advocate of a "support Alaska" strategy over the past 18 months. It was Shocken, whose business activity at his successful boutique merchant bank has made him somewhat of an expert on how mergers and acquisitions play out, who first reached out to me about "the business community needs to take sides and do so visibly against Delta." I was receptive to Shocken's argument, and did several columns commencing with one that said Delta had turned from partner, which had been its relationship with Alaska, to predator. The reaction of others I met with in the business community, not just in Seattle but across the state, after the first column indicated to me that Shocken wasn't merely crying wolf, particularly after a member of Alaska's board had confided "we're really worried." So was the Delta issue a consideration for Alaska in its decision to approach Virgin America last fall about a sale? Asked about that, Joe Sprague, Senior Vice PresidentCommunications & External Relations, said "We're viewing this as a combination that will make Alaska stronger and better positioned to remain a successful, independent, Seattle-based company for decades to come." The deal still needs to pass through regulatory approval and as part of its information pack Alaska Airlines issued a timeline with the deal set to close January 1, 2017, and full integration by the first quarter of 2018. The merge is likely to attract the scrutiny of Justice Department officials already pursuing allegations that America's biggest airlines have colluded to keep airfares high. And since the takeover will mean California no longer will have an airline based in the state, which served as home to a variety of carriers over the decades, there may well be an effort to convince regulators it's not good for consumers. For those who like a chuckle with their politics, it would amusing if Alaska-Virgin provided California's dynamic female Democratic duo in the U.S, Senate reason to clash for the first time with their Washington Senate Democrat counterparts. But antitrust experts suggest the takeover of Virgin by Alaska probably will be seen by those federal regulators as a union that will better equip Alaska to compete against larger rivals. And if the concern of Shocken and others who have watched the shrinkage of the airline industry by takeovers play out were legitimate, Alaska was destined to lose a battle with Delta so the prospect of an erosion of discount fares was bound to be an outcome, whether because if Alaska's growth or its decline. The final piece of the Delta puzzle that needs to play out is the possible restoration of a Delta-Alaska partnership arrangement. The effort to achieve that is certainly a possibility with the retirement of Richard Anderson from the CEO role, since he was the key protagonist in the obvious beat-down-Alaska strategy. But since Anderson remains as executive chairman of the Delta board, he may still influence a Delta move to restore relations with Alaska, returning to partner instead of predator. But the fact is any thoughts about that are not even on Alaska's agenda right now. There's a growing concern among Seattle-area business leaders that they are seeing a once mutually beneficial partner relationship between Alaska Airlines and Delta Air Lines changing to one in which Delta seems to be moving from partner to predator. There is an obvious agreement within the business leadership that losing Alaska would be a significant blow to the economies of Seattle and the state. And that is leading many toward a conviction that the business community can't merely stand on the sidelines to watch to see what the outcome is of a battle between the world's second largest airline and hometown Alaska. Thus if those expressing such concerns are accurate, then Seattle will need to shed its "Seattle Nice" image for a time to forcefully take a position in support of Alaska. "The business community must take sides in this and do so forcefully and visibly and an important part of its message is that Delta is actually not good for Seattle," suggests Joseph Schocken, president of Broadmark Capital, a successful Seattle boutique merchant bank that focuses on emerging companies. "Delta is anti-Boeing, and thus anti-Seattle, with both its dollars and its political clout," Schocken said. "With its dollars, it buys Airbus planes rather than Boeing's and with its political clout it opposes the Ex-Im bank that is important to Boeing's success," he added. As I talked with various people in the business community, there was an expression of the need to have a pro-Alaska effort, even a forceful one, but not an Anti-Delta one, lest that generate sympathy for the Atlanta-based airline since it is a very successful airline that employs a large number of people and successfully serves parts of the region's air-carrier needs. Yet as each got into the competitive aspects of the issue, comments frequently turned from support of Alaska to negative on Delta. As business people discuss this Alaska-Delta struggle, there is a logical defense of free-markets competition but a dark view of competitors who turn predators. And I detected growing sense that predator is what Delta's competition with Alaska has devolved into. One who best summed up the competition issue was John Fluke, whose family's business leadership, investment focus and philanthropic involvements are widely known and respected, who said: "The notion of free markets and competition are absolutely necessary to the success of our economic system and the effort to gain advantage over competitors, ethically pursued, benefits customers." But Fluke suggested that the current competitive activities amount to Delta "abusing" the definition of competition, saying "its tactics with everything from current pricing to their philanthropic outreach with nonprofits here are likely to last only as long as it takes to drive Alaska into submission." "If that happens, then airline tickets will eventually cost more, route structures will become less accommodating and Delta's support of important philanthropic causes will be lower and that would be abusing the real meaning of competition," he added. Woody Howse, whose Cable & Howse Ventures basically launched the venture-capital industry in this region, exemplified the enthusiasm of Alaska supporters when he said "Alaska Airlines is one of the most community minded, customer serving and socially contributing corporations in our region." But his comments also quickly turned against Alaska's challenger, noting his view that "Today Alaska Air is being attacked vigorously by the Carpet Bagger Delta Airlines, coming to town with Airbus (not Boeing) airplanes and viciously attacking the Alaska Air routes with competing schedules. Our Northwest Community must band together and support the company that has so supported us through the good as well as difficult times." "With Delta's current actions and apparent ulterior motive in Alaska's hometown hub, engaging in a process intended to squeeze Alaska Airlines with the objective of acquiring, we customers need to be very alert to the probable outcome if Delta is successful," Howse added. Mike Kunath, principal and founder of Kunath, Karren, Rinne & Atkin LLC, a successful Seattle investment advisory firm, summed it up succinctly as: "Alaska has been a true supporter of the region. Delta never will be." Herb Bridge, longtime Seattle civic leader and philanthropist as well as chairman and CEO of Ben Bridge Jeweler for several decades before guiding the company into acquisition by Warren Buffet, notes that corporate acquisitions themselves are not evil. "It is possible for an important local company to be acquired in a way that allows it to retain local control and oversight, as happened with our acquisition by warren Buffet," Bridge said. "But when the acquisition is pursued in a predatory rather than a friendly manner, not only the shareholders of the pursued company but the community it serves are losers. There is nothing beneficial about Delta's pursuit of Alaska." Alaska CEO Brad Tilden, retired CEO Bill Ayer and board members are reluctant to get into any Delta-bashing conversation, preferring to focus on Alaska positives. Ayer, who as Alaska chairman and CEO for a decade before retiring in early 2012 guided the carrier through some of the industry's most tumultuous times, told me "The question of whether Alaska could remain independent has been raised for decades." "Our response was that a locally based, independent airline was better for customers, the community, employees, and investors. While there were no guarantees of remaining independent, all we could control was our own performance, and our chances were much better if we did a great job for each of those stakeholders," he said. And as Tilden puts it, "The transformation over the last decade has been all about cost. We're trying to balance low fares and lots of service to the destinations (passengers) want, with a strong and successful company that can grow and buy new airplanes and has the capital to add new services." The financial results are impressive as the parent company for Alaska Airlines and its regional sister carrier Horizon Air made a record $508 million profit in 2013, and the stock continued a steep ascent to five times its value from just five years ago. What needs to happen is for Delta CEO Richard Anderson to be convinced by those who know him well, and that includes some in Seattle, that he is risking a serious downside in creating the potential for an in-your-face attitude among Seattle business people on behalf of Alaska. 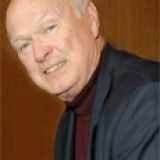 For as Schocken summed it up: "There needs to be a real corporate campaign to encourage flying Alaska, discouraging flying Delta and make it unpleasant, hurting Delta's bottomline so Anderson decides that not only isn't it going to be as he thought, but shareholders and board members are getting unhappy.'" Evidence that neither Fluke, Howse nor any of those who echo similar sentiments about Delta targeting Alaska are out of line is Delta's own home page where it headlines "Exclusively for Seattle, 2x miles all year long." But Delta's sharpest critics could suggest with a smile that what happens when you click on that link on Delta's home page might prophetically point to where Delta would be for Seattle if they were to push Alaska into a merger. The click leads to a page that says "the requested page could not be found." 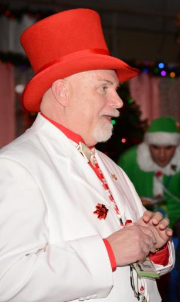 For Steve Paul, bringing the Magic of Christmas to a group of about 60 Spokane-area homeless and foster children in the form of a flight to the North Pole is a year-round focus that he undertook 14 years ago to "use the power of Santa and Christmas to bring an over-the-top memory for kids usually consumed with worry." So late afternoon this Saturday, 65 children, aged 4 to 10, selected by shelters and community programs in Spokane and Coeur d'Alene, will board the Alaska 737-900ER at Spokane International Airport, accompanied by their personal elves, for the approximately half-hour flight to the North Pole. Others on board, in addition to the kids and their elves, will be Dave Campbell, new president of Horizon Air, and other representatives of both Alaska and Horizon. 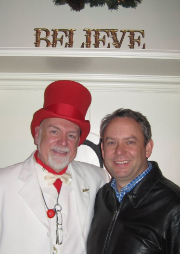 This is the eighth year that Alaska has operated the flight for Northwest North Pole Adventures, the 501c3 that Paul, a Senior IT Project Manager at Ecova,created and serves as president and CEO. He spends much of the year preparing for the event by working with organizations, gathering sponsors and overseeing details, all on a $200,000 budget that includes in-kind, like the Alaska flight. So Saturday the children will show up at the airport, meet their "buddy elf" and, with the help of the TSA workers, pass through security despite alarms set off by the metal jingle bells on their clothing. Then they will board Alaska flight 1225, which upon takeoff becomes Santa 1, guided by Paul who, for the day, becomes Bernie, the head Elf. As the flight nears its conclusion, the passengers will be told to pull the window shades down and chant the magic words that will allow them to land at the North Pole. 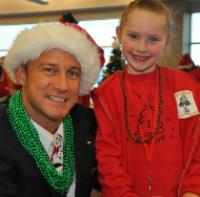 Then the plane will land on the other side of the Spokane airport to be greeted by Santa, Mrs. Clause, extra elves and a few live reindeer. Equally priceless is the reaction of Paul and others involved. "I know I can't fix the situations in life that have brought these children to the place we find them" he told me. "But I can give them a brain full of amazingly magical memories of a day when they took their first airplane ride, when they touched their first reindeer and had their own elf as best friend." Blythe Thimsen, editor of Spokane Coeur d'Alene Living magazine who first alerted me to this amazing community experience five years ago when she served as an elf on that year's flight, says that"from business leaders, to media, to financial support and those who are elves at heart and want to see this organization succeed, support is ever growing." "With an outpouring of interest and support from volunteers and the community - to the tune of 30 wannabe elves on the wait list, hoping to be assigned a spot as an elf - it is clear that support for Spokane Fantasy Flight continues to grow in the community," she told me. United Airlines, which has done these North Pole Fantasy Flights in a number of cities since 1992, launched the Spokane flight in 1997 but the United planes didn't take off, merely taxied around the airport. It was while traveling in and out of Spokane around that time that Paul learned of the flight, which has always been amazingly low visibility, and sought to be involved. He not only became involved but took over responsibility for the event in 2000. United continued the Spokane flight until 2007 when the airline failed to assign a plane to the event and Paul turned to Alaska, which not only quickly provided the plane but it's employees asked, "why not take them up for a flight?" So Alaska did. Since then, the Spokane Fantasy Flight has grown in popularity within the business community, despite remaining little known to the general Spokane population, and has become a source of pride and team building for Alaska and Horizon Air. To the point where, when I asked Paul if he had the same pilots as in previous years, he said that, in fact, there were a couple of Anchorage-based pilots doing the duty this year but that last year's cockpit crew was trying to buy their way back aboard with "payoff" offers to their replacements, who have remained uninterested! And little wonder since, as Alaska CEO Brad Tilden, who has been involved in the event first in 2011 when he was still president and once since he assumed the CEO role, put it: "Seeing the effect of this in the eyes of the kids is an amazing experience. For those who might, for any reason, view this as deluding the children, an elf on one of the flights summed it up best. "If you're a little kid on your first plane ride and your ticket says North Pole, and the shades are drawn, and everyone, including the flight attendants and all the elves are saying the magic words, then who's to say you haven't landed at the real North Pole?" Or as Paul sums it up for the longer-term perspective: "My hope is that the children leave with a stronger sense of belief, not only in the magic of Christmas but in themselves and the possibility of positive things in their future." The annual Fantasy Flight to the "North Pole" that Alaska Airlines makes possible each year for 60 disadvantaged Spokane-area kids and their personal elves is now attracting the attention of other cities who might like to create similar events, possibly in partnership with Alaska. 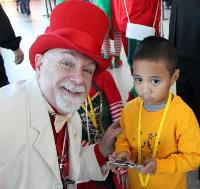 The children, selected from programs for homeless and underprivileged kids in the Spokane and Coeur d'Alene areas, board Alaska Airlines "flight 1225," designated "Santa One," Saturday at Spokane International Airport. 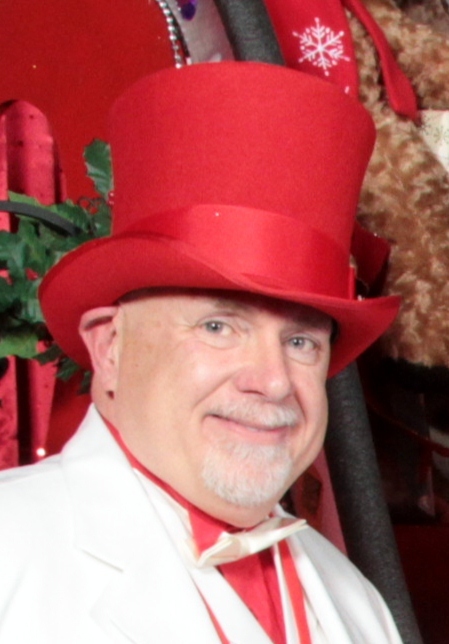 This is the fifth year Alaska has operated the flight in Spokane for Northwest North Pole Adventures (NNPA), a 501c3 created and overseen by Steve Paul, president, CEO and executive director. He's a software executive who spends much of the year preparing for, agonizing over funding for,and carrying off the event, where at trip time he's better known as "Bernie" the Head Elf. Alaska made the flight unique when it took over from United Airlines after that airline was unable to make a jetliner available in December of 2008. Though a number of airlines around the country, actually around the world, have been engaged in such Christmas Season flights since even before Alaska got involved, it was Alaska employees who asked: "why can't we take the kids up in the air?" Thus it was that Alaska was the first to actually fly away, taking the kids to "the North Pole." United now has North Pole adventures, for children with serious illnesses, that take to the air from both Los Angeles and San Francisco for flights around California that land back at the airport from which they departed. Other airlines doing "flights" that mostly involve taxiing around the airport with window shades down are Continental, American and Southwest. 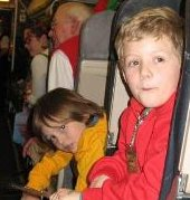 Elsewhere in the world, kids are carried aloft by British Airways in Scotland and Aerolineas Argentinas, which conducts fantasy flights between Buenos Aires' two main airports. Recognition for the Spokane event got broader last year thanks to coverage by Seattle's KCPQ-TV, which actually also did a program on it for CNN as well as its own regular news coverage. That greater visibility is providing both relief and opportunity for Paul. "This is the first that I am not panicking about funding as the event nears," he said in an interview. He's attracted a number of local sponsors at various levels and has a cash-and-in-kind budget this year of just under $200,000. The key in-kind, of course, is Alaska's participation, a role that has been low key from the outset in 2008. "Alaska has never pressed for any visibility," Paul noted. "They are just happy to be great philanthropists for this project, though many of Alaska's employees consider this a high point of their year." As many as 30 Alaska and Horizon Air employees will participate this year, though more sought to volunteer. "Alaska wants to do things for the right reasons and visibility is typically not high on the list of right reasons," says Alaska's new chairman and CEO, Brad Tilden. "But it's not that we need to be secretive about something we're very proud of supporting the event and many others who are involved, including many of our employees." And as a new CEO, he brings his own sense of expanding upon this event by being open to seeing something similar develop in other Alaska cities. "We'd be happy to help in other cities," Tilden told me in an email exchange. "I think Steve and his team put in an unbelievable amount of work to bring this event alive, and we'd have to make sure we have a group in another city that is onboard with all of this." "But again, I'm very open to the idea," he added. "Seattle would like to have a similar Fantasy Flight for kids but the challenge is how to scale it," Paul notes. "They'd need a facility, sponsors and community support behind the idea." "We could easily do a Seattle one, bringing kids from there to Spokane to have the same experience our kids do, then fly back home.," he adds. Among the Alaska-served cities where such Fantasy Flights don't yet occur, in addition to Seattle and Portland, are San Diego, Orange County and the Palm Springs area. The Spokane flight has priority status with the FAA once it's loaded and ready to fly and "Santa One" comes up on the screen. Then the flight's own personal air traffic controller takes over, Paul said. "It becomes just like Air Force One in that respect." "When we send out invitations to the kids, we have them give us a wish list of what they want for Christmas," Paul explained to me in an interview for a column on him I did a year ago. "We take those lists and buy each of them a toy from that list. So as each child tells Santa what he or she wants, Santa can reach into his bag and pull that present out for them. The looks on their faces as he hands it to them is priceless."